Chinese Mahonia has a compact upright growth habit. Its leaves are pinnately compound and have a fern-like appearance. The leaflets are green with paler green undersides with sharply toothed margins. Mahonia fortunei produces short upright yellow flower clusters early to mid fall followed by white frosted, dark purple to blue fruit, although these seldom develop. 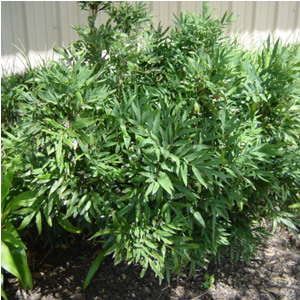 This shrub grows 4 feet tall and 3-4 feet wide.